"Looking for Quality and Helpful Christian Living Information?" Providing you with quality and helpful Christian living information is our mission. You will benefit from my almost twenty years of senior Pastor experience, seminary education (Doctorate of Ministry Degree), and gift of making things simply (some times with a pinch of humor - smile). question ...Why should you sign up for your free newsletter and read the articles on this website? 1. Quality and helpful Christian living information. You will receive quality material that I am willing to own before the judgment seat of Christ (see I Cor. 3:10-15). "How does this help YOU live a Christian life" will be a key question for everything posted on this site and in the newsletters. 2. Your ability to be a part of something great. You will be given the opportunity to ask questions, submit feedback, and and give input on the various articles. Because of your input and others as generous as you, this site will be a blessing to thousands and then tens of thousands around the United States and the world. 3. It is free. You will have access to over 300 pages of quality and helpful Christian information for free. We will give our opinions on various resources, there will be various ads, and donations are always welcomed, but no purchase is necessary. 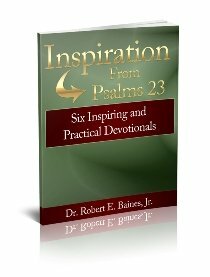 In fact, right now, you can secure a free copy of "Inspiration From Psalms 23: Six Inspiring and Practical Devotionals," just by giving your name and e-mail (click here). Do you understand Christian growth, and are you focused? Here you will find discussion notes for various growth group/discussion sessions. Do you know that taking care of your Christian health is an essential part of your Christian living? Do you know that Christian finance is a part of Christian living? Tribute to dad ... this page is dedicated to a book a wrote to salute my father's life and legacy. What's New on Christian Living Site? Latest articles on Christian growth, devotionals, Sunday School and Bible study notes, and articles on health and finances.